Radio waves, like light waves and all other forms of electromagnetic radiation, normally travel in straight lines. Obviously this does not happen all the time, because long - distance communication depends on radio waves traveling beyond the horizon. How radio waves propagate in other than straight-line paths is a complicated subject, but one that need not be a mystery. 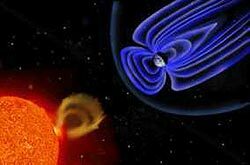 This page provides basic understanding of the principles of electromagnetic radiation, the structure of the Earth's atmosphere and solar-terrestrial interactions necessary for a working knowledge of radio propagation. More detailed discussions and the underlying mathematics of radio propagation physics can be found in the references listed under additional resources. 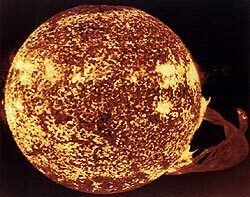 The Sun, being the largest engine in our solar system, has a great effect on propagation as its "exhaust" interacts with our Earth's magnetic field. A rudimentary knowledge of sunspots, solar flares and mass ejections will help the amateur take advantage of these effects to enhance his pleasure, or understand his plight. A good basic understanding of this can be had by reading the article "The Sun, the Earth, the Ionosphere." See also the list of other articles on propagation. You can get custom professional-grade high-frequency (3-30 MHz) propagation predictions online. As reported in Space.com on December 7, 2018, study by Bhowmik and Nandi published in the peer reviewed Nature Communications on December 6 suggests that the new cycle will begin about a year from now and peak in 2024. 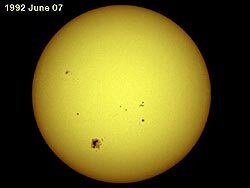 Solar Cycle 25 should be of similar or of greater intensity than Solar Cycle 24. Where can I find solar data? Mark Downing, WM7D, has graphs of solar data on his web site. Highly recommended reading for understanding these charts. These predictions are for a solar flux of 67. These predictions are for a solar flux of 66. These predictions are for a solar flux of 73. These predictions are for a solar flux of 71. These predictions are for a solar flux of 70. These predictions are for a solar flux of 69. These predictions are for a solar flux of 68.